The sacroiliac joints lie below the dimples in your low back. Each joint is between the Innominate bone (A) and the Sacrum (B). These joints are involved in movements of the low back and hips such as walking, moving between sitting and standing, climbing stairs, etc. 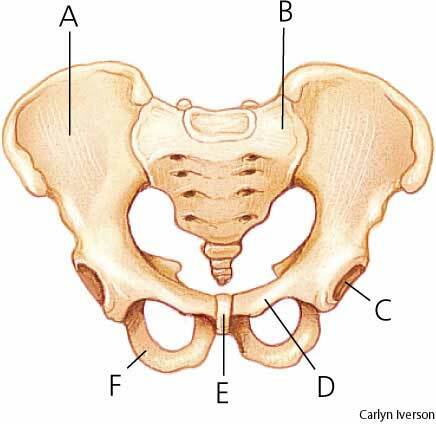 The pubic symphysis is the joint (E) at the front of the pelvis between the two innominates (A) at the pubic ramus (D). This joint rotates and compresses, especially during the gait/walking cycle. Pain is primarily experienced at the sacroiliac joints and tends to be a deep ache with a sharp grabbing sensation with certain movements such as standing up from a seated position. This condition tends to be a result of muscle imbalance within the pelvis due to tightness or weakness, which effects the joint’s ability to move freely and symmetrically. Sacroiliac joint dysfunction can occur in any person and is not specific to pregnancy. Pain is primarily experienced in the sacroiliac joints but to a much greater intensity than with sacroiliac joint dysfunction. This is a condition largely associated with pregnancy and can become very debilitating, especially in the final few months, with a small percentage of women requiring a wheelchair or crutches to move around. For pregnant ladies this condition occurs due to the increased levels of relaxin, estrogen and progesterone hormones which act to soften the pelvic ligaments to enable birth. In some women, especially those with prior history of lower back pain, the ligament softening occurs more than normal and results in the sacroiliac joint not being stable enough. Pain is primarily experienced at the pubic symphysis joint at the front of the pelvis with the joint widening (<9mm). Pain may also be experienced in the sacroiliac joints, gluteal muscles and the inner thigh muscles. This condition occurs due to muscular imbalance from weakness or tightness that prevents symmetrical and normal movement/functioning of the pelvic joints. This condition can occur in any person and is not specific to pregnancy. Pain is primarily experienced at the pubic symphysis joint at the front of the pelvis with the joint widening (>9mm). Pain and disability is much greater than with pubic symphysis dysfunction. As well as muscluar soreness, many women also experience a clicking or clunking sensation in the pelvis. For pregnant ladies this condition occurs due to the increased levels of relaxin, estrogen and progesterone hormones which act to soften the pelvic ligaments to enable birth. Some women however seem to be affected more by these hormones and the joint widening is greater than normal. What can be done about these conditions? If you, or someone you know, is suffering any of the above conditions or symptoms you/they may benefit from seeing a registered Osteopath like Dr. David Howard. Even if the conditions and/or symptoms cannot necessarily be ‘fixed’, they can be managed throughout the pregnancy – osteopathic treatment can reduce the intensity/severity of any pain being experienced. If you’re still unsure as to whether osteopathic treatment would be of benefit to you, please feel free to call the clinic – 9379 3888 – or send through your questions/queries via the Contact Us page.